Scaredy Squirrel series by Melanie Watt. After Augustine created such an impact, we checked out all the books by the Melanie Watt, and discovered the Scaredy Squirrel series . Scaredy Squirrel is HILARIOUS. He likes things done in a certain routine, and likes to live in a certain controlled environment because he is paranoid about the great unknown. But something or other happens to him that is "not part of the plan" that causes Scaredy to panic at first...but eventually he improvises & realizes that maybe the unknown isn't so bad after all. The layout is unique, & some of it reads like a comic strip. It had my 4yo laughing out loud while reading and then giggling about it long after. 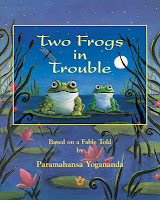 Two Frogs in Trouble - a Fable by Swami Yogananda Paramahamsa, Written by Natalie Hale. Cherished greatly by my 6 year old who has pored over this book in ever bit of detail possible, it is a story of two frogs who are hopping about merrily one day and suddenly hop into a pail full of milk. They keep swimming to save their lives, but pretty soon one of them gives up. The other goes on against all odds and battling every weakness, and with all that churning, the milk turns to butter and the frog hops off to safety. It seemed a bit morose to me, but Winkie enjoyed it beyond the morbidity of death, to enjoy his favorite part which is how the two frogs play merrily together. 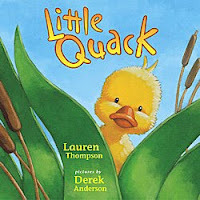 Little Quack - by Lauren Thompson, Illustrated by Derek Anderson. This cute tale of an even cuter little duck has been the biggest hit of the year with our 3 year old. Little Quack lives in the pond along with his siblings, Widdle, Waddle, Piddle and Puddle and their Mamma Duck. In this first book of the series, Mama Duck is trying to teach her ducklings to swim. Each one is afraid, but under Mama's gentle coaxing...Come on little ducklings, You can do it..I know you can...they all find the courage to try. Even the smallest of them all, Little Quack. Set in the bright and cheerful landscape of a pond and the reef surrounding it, the bright yellow colour of the ducklings' coat is sure to make the sun shine out even during the night time read. Repeated phrases make it easy for little ones to know what is coming next, and to pitch in at the right times, and "read" the book themselves. Poppins Mom and her little ones enjoyed Tulika Books - especially The Neverending Story and What Shall I Make? (note from the compiler - "What Shall I make?" makes another appearance!). Apart from them, they also enjoyed the all time classic Dr. Seuss. Dr. Seuss all the way! My older one aged 4, has been overdosing on Dr. Seuss. From Cat in the Hat to Fox in Socks to Wocket in my Pocket, all of them have been read and re-read this year. I think partly the charm lies for her in the funny words and partly the confidence that Dr. Seuss books create in young readers - since she's relatively a new reader she's enjoying that power. 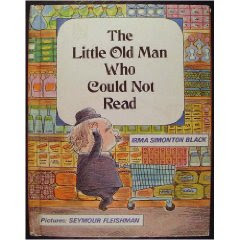 The Little Old Man Who Could Not Read by Irma Simonton Black, Seymour Fleishman. One of the much-enjoyed 2009 picks, this edition was my husband's when he was little, waiting to be introduced to our daughter when she turned 4 in Spring 2009. It is a very simple story with a subtle yet powerful message - i.e., literacy - laced with humor and presented with simplistic charm that might confound the skeptical adult mind. An old man, who makes wooden toys for a living, never learnt to read. He just never wanted to learn. One day, his wife decides to go for a visit, leaving him to go shopping for food while she is gone, assuming that he will be able to recognize the food items at least by sight even if he cannot read the labels. Polar Bear, Polar Bear, What Do You Hear? by Eric Carle. This happens to be the most-requested book in 2009 by my 1.5 yr old. Besides the repetitive/predictable nature much like Brown Bear, Brown Bear, I like that this book focuses on animal sounds - roaring like a lion, growling like a polar bear, trumpeting like an elephant, snarling like a leopard, braying like a zebra, bellowing like a walrus - one cannot read these words without feeling the urge to sound like them :) Plus, of course, Brown Bear, Brown Bear and Panda Bear, Panda Bear in this series and Jean Marzollo's I Spy board books kept us happy in 2009. Our 7 year old son's favourite set of books this year has been the Usborne Young reading series. There are a lot of books - on magical animals, gnomes and goblins, mythology in this series. His favourite of the lot was 'The amazing adventures of Hercules'. I think it is the simple language combined with the beautiful and funny pictures that has him scouring for more books in this series. Tiara Club Series, written by Vivian French and illustrated by Sarah Gibb. My six year old daughter is a firm fan of this series. The books are about a group of girls at SIlver Towers, a school that trains young ladies to be perfect princesses - imagine your typical school adventures mixed with fairy godmothers,royal balls and a great deal of magic! The series is quite vast,as there are several sub-series (the Katie books, the Emily books, and so on) , each told from the perspective of one of the girls at the school. Each book also has a secret word tucked away in one of the illustrations. 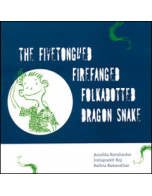 My choice from my daughter's bookshelf would be The Fivetongued Firefanged Folkadotted Dragon Snake.This hilarious little book, from the early days of Tara Publishing, is a must read for anyone with a yen for quirky, unconventional characters. Told in the first person, it brings us a school story with a twist in the tail.The narrator of the story goes to school one day, and watches as Arun sees something move in the bushes. AAAAARGH! he screams, SNAKE! SNAKE! His friends scoff at him, of course, so he decides to describe the horrible moster he has just seen. It is 25 feet long, he says, with red eyes and a face like a dragon. And it spits fire! Written by Anushka Ravishankar, among India's best writers for children, this is a terrific, well paced story - equal parts humour and mystery - with a delightful surprise ending. The short, snappy text is well complemented by Indrapramit Roy's quirky monochrome illustrations and Rathna Ramanathan's zany typography. Each character is assigned a different type face which in turn inspires you to try different voices when reading out this story. My daughter and I still re-read it constantly, acting out different parts with the funniest voices we can come up with. The book has a colour scheme that is rather unconventional for children's books - just white, green and dark blue - yet is still very eye-catching. As the story proceeds, the illustrations get increasingly spare, even sinister, building up suspense. 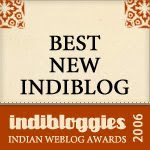 Something is behind me, mutters Arun, making the narrator and the reader increasingly nervous. Could it be -gasp!- that horrible dragon snake? or something much worse? Thoroughly enjoyed the picks and the list! KM, your book is now sitting in our library bag! Satish's son reading fantasy fiction?!! Apple does not fall far from the tree huh? !